Do you use SkyDrive only for storing photos and miscellaneous files? What about important correspondence or files containing personal information? What about sensitive files such as tax returns or copies of bank statements? "Is Skydrive suitable as a place to sync/save sensitive information (e.g. tax/financial records) or is it just really for things like photos, unimportant Office files etc? It would make things simpler for me if I could use Skydrive to sync all my files including the sensitive ones, but I am hesitating on security grounds." "Short answer: Yes, sensitive documents (e.g. tax/financial records) saved to SkyDrive are secure. The only way to access those files is by secure logon with your Microsoft Account. That raises the reminder of ensuring that a strong/unique password is used for your Microsoft Account. For additional information regarding a strong password, see Password Generator & Checker | How Secure is my Password. Additionally, regardless of whether anyone uses SkyDrive or not, I strongly recommend taking the steps to protect your account. This article written for "Hotmail" equally applies to the revamped Outlook.com: Hotmail Security to Protect and Recover Your Account ~ Security Garden." Why, after reconsideration, do I consider my response short-sighted? Let's take a closer look at transporting and accessing files on SkyDrive. When saving your files to SkyDrive, the method used for transport encryption of your data from your computer to SkyDrive is called Secure Socket Layer, or SSL. SSL protocol uses standard key cryptographic techniques for the communication session between the client (your computer) and server (SkyDrive). Thus, during transit from your computer to SkyDrive, your data is protected from interception and is reachable and readable only on SkyDrive. However, it is important to consider that SkyDrive does not include any additional encryption on the files after being uploaded. Update 06Dec2013: Please see this important information by Brad Smith, General Counsel & Executive Vice President, Legal & Corporate Affairs, Microsoft, about plans to strengthen the encryption of customer data across Microsoft networks and services. Protecting customer data from government snooping. In other words, the only way to access the files set to "only me" is by logging on to SkyDrive with your Microsoft Account. But, what if your Microsoft Account is compromised or if you inadvertently change the setting to public? Another situation that could compromise the security of sensitive information is that anything uploaded via a mobile device is automatically stored in the Mobile uploads folder. Fellow Microsoft MVP, Richard Hay, discovered recently that the Mobile uploads folder in the SkyDrive cloud storage is set by default as Shared with Friends. The default setting can be changed by logging on to your SkyDrive account via your browser. There should be no concerns about security of your files stored in a private folder on SkyDrive, accessible only by you when you logon with your Microsoft Account. However, for sensitive files, you may want to add an additional layer of protection to those files. The easiest method is password protecting Microsoft Office files, illustrated in this Office support document: Protect your document, workbook, or presentation with passwords, permission, and other restrictions. Important: Be careful to note somewhere offline the password used to protect your Office files. There is no way that Microsoft can help you retrieve forgotten passwords. PDF documents with AES-256 encryption PGP-encrypted files"
For particularly sensitive information, I suggest you read both How secure are files on SkyDrive? and Microsoft account, Hotmail, SkyDrive. This program has been discontinued. As a SkyDrive Insider, I am excited to share information about SkyDrive. If you have a question about this post, please leave a comment and I'll do my best to assist. Service Pack 1 (SP1) for Windows 7 was released over two years ago. Yet, there are many home computers that do not yet have it installed. Windows 7 SP1 is a collection of security patches and non-security fixes, it also includes client-side support for RemoteFX and Dynamic Memory. More importantly, Windows 7 computers without SP1 installed reach "end of support" on April 9, 2013. Due to the importance of Windows 7 SP1, it is being added to Automatic Updates starting March 19, 2013. Many Security Garden readers are comfortable moving around their computer, but others are not as experienced. For those readers who have no idea whether SP1 has been installed on their computer, here is how to find out. Double-click winver.exe in the Programs list in the search results. If you see Service Pack 1, you are all set. On the other hand, if SP1 is not installed, it is very important to get it installed. Make sure your computer is malware free. Run an updated scan with your antivirus and anti-malware software program. Some security programs may interfere with the installation so it is suggested that you temporarily disable them. Do not disable your Firewall. If you are unsure how to disable your security software, see the instructions in How to disable your security applications at the Tech Support Forum. If you are using a laptop, be sure to be plugged in to an electrical outlet rather than a wireless connection. In the event you have a problem installing the Service Pack, download and run the System Update Readiness Tool (SURT). Have patience because the tool may take as long as an hour to run. Click Start and type system in the search box. Click system in the Programs list. The operating system will be displayed as either a 32-bit Operating System or a 64-bit Operating System. If, after running SURT, you are still unable to install SP1, expert help is available at Sysnative. Register for a free account and follow the instructions in the Windows Update Forum Posting Instructions topic. Microsoft released seven (7) bulletins. Four bulletins are identified as Critical with three bulletins rated Important. The critical bulletins address 20 vulnerabilities in Microsoft Windows, Office, Internet Explorer, Server Tools, and Silverlight. The bulletins rated Important address issues in Microsoft Windows and Office. With today's Windows Update, Internet Explorer 10 in Windows 8 and Windows RT is being updated to enable Flash content to run by default. On Windows 8, all Flash content continues to be enabled for IE on the desktop. Additional information is available in the IE Blog post, Flash in Windows 8. Included in updates today is an update addressing an issue in the Kernel-Mode Drivers where an attacker could own your machine by inserting a malicious USB device. In this scenario, logging on to the machine is not required. Additional details about the update are available in the below-linked MSRC Blog post. Adobe Flash Player was updated today to address critical security vulnerabilities. These updates address vulnerabilities that could cause a crash and potentially allow an attacker to take control of the affected system. The CanSecWest security conference is underway and Firefox fell along with others. However, Mozilla developers quickly diagnosed the issue, built a patch, validated the fix and the resulting builds, and Firefox version 19.0.2 has been sent to the release channels. On Tuesday, March 12, 2013, Microsoft is planning to release seven (7) bulletins. Four bulletins are identified as Critical with three bulletins rated Important. The critical bulletins will address vulnerabilities in Microsoft Silverlight, Internet Explorer, Office, and Microsoft Server Software. 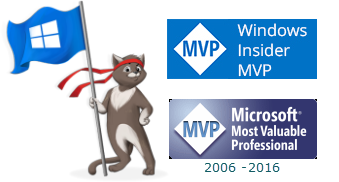 The bulletins rated Important and will address issues in Microsoft Windows and Office. WinPatrol users who experienced the recent problem with crashes will be happy to learn that the source of the problem has been tracked down and resolved. For information about the crash problem, see Hackers Steal WinPatrol Data Already Available. As Bill Pytlovany explained: The WinPatrol update includes a layer of protection that will discourage any future attacks and crash safely. If an error occurs for any reason, Scotty will continue to be graceful in his behavior so other programs will never at risk of losing work currently in progress. Unfortunately, there are programs that require Java in order to function. In the event you are not in a position to uninstall Java, please update to the latest version, Java 7 Update 17 (correct, Version 16 was skipped). Although Oracle was planning to wait until April to update Java to address CVE-2013-1493, Java 7 Update 17 was released by Oracle today. Security Alert CVE-2013-1493 addresses two vulnerabilities affecting Java running in web browsers (CVE-2013-1493 and CVE-2013-0809). 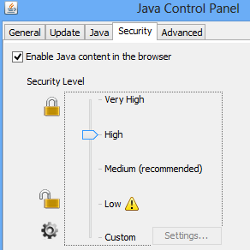 Although Oracle changed Java security settings to “high” by default, it is advised that users of Java confirm the setting. With the setting at high, you will be prompted to authorize the execution of applets which are either unsigned or are self-signed, thus providing the ability to deny the execution of a potentially malicious applet. Changing the setting to "Very High" will result in unsigned (sandboxed) apps not being able to run. 1) In the Java Control Panel, set the security to high.